Need to tackle your hunger before the tournament? Got your eye on something scrum-ptious? Don’t let the team down – fuel up before the Rugby 10s on Caxton Street! Not only is Brewski a short stroll from the gates of the stadium, but they stock over 200 kinds of bottled craft beer and rotate eight different beer taps every day! Learn how to fly when you try their Low ‘n Slow BBQ, the smell alone will make you think you’ve died and gone to heaven – and vegetarians, meat your match with the best vegan BBQ around, like pulled jackfruit tacos! Darling & Co brings a touch of sophistication and a whole lot of boozy goodness to your Suncorp trip. With filling dinners and plenty of cocktails until late, Darling & Co can take you from pre-show to post-drinks in charming style. Craving a brilliant burger? 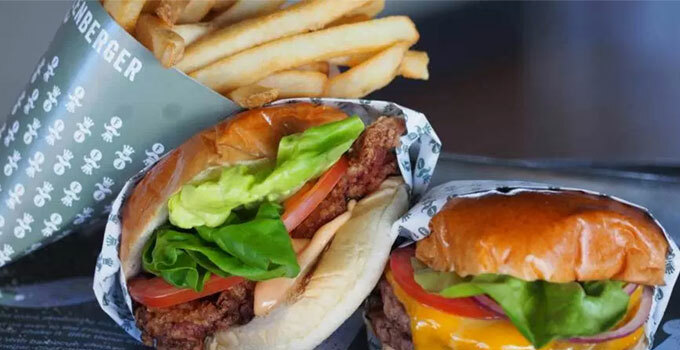 Look no further, Fritzenberger has you covered with their insanely delicious menu, and with optional add-ons like maple syrup candied bacon, can you disagree? Grab some snacks from their sides, how about blue cheese sauce Frtizen Wings? Or if you’re feeling especially piggish, crumbed pork bites could be your calling. As well as local craft beers, Fritzenberger has their own beers on tap. Get a pizza this, for great atmosphere and amazing food, Enzo & Sons delivers. With drinks and service off the charts, you’ll feel right at home with an Aperol Spritz in one hand, woodfired pizza in the other. Passionate about pasta? Try their incredible angel hair pasta, lemon, garlic, chilli & pangrattato. Nothing says rock ‘n roll like a good beer, and that’s what you’ll find at Newstead Brewing Co. – beer, beer, and more beer. Inside their contemporary pub you’ll see the brewers doing their thing behind a massive wall of glass while you feast on a variety of pizzas, burgers and a pint (Or 3). Can’t decide whether you just want to nibble on arancini balls and knock back a few craft beers or wine and dine on peppercorn minute steak with a glass of rose? Not to worry, just decide once your comfortably seated at Paddington restaurant Hope & Anchor. Freshly shucked oysters and duck parfait with crisp croutons may not be your usual gig feed, but trust us when we say they really should be – especially paired with a bubbly glass of champers or a creative cocktail. Want something a little more manly? Sip on a rye and cognac Sazerac while you knock back those oysters. If one course just isn’t enough to get you through a show, Libertine will dish up 7 of them for you, each one as drool-worthy as the next. Although fair warning, after a few courses of mushroom potstickers, BBQ duck crepes and twice cooked pork belly, you might just be too stuffed to make the short walk to the stadium. It might be all romantic lighting and atmosphere in their rustic dining room, but Peasant definitely has a tapas menu worth sharing with a big group. 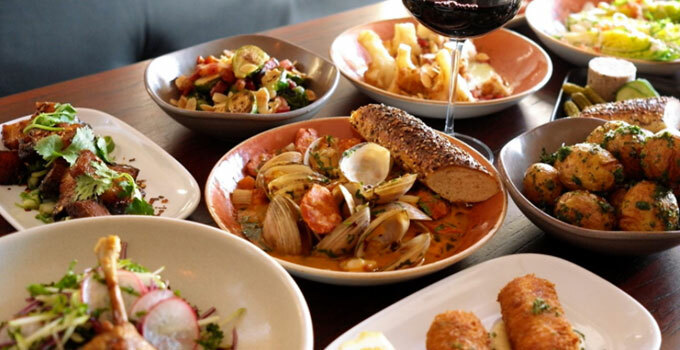 Pile the table with seared scallops, lamb empanadas and cheesy croquettas, and order a whole lot of sangria to go with it. With an extensive menu of Chinese dishes, the only hard part about dining at Sichuan Bang Bang is deciding what to get. We won’t judge if you get seconds, or fourths. Take a peak at their duck, or sea for yourself how good the chilli crispy soft-shell crab is. And those are just some of the appetisers. Wanting to skip the masses on Caxton Street? We’ve got just the Cribb for you, and it’s only a stones throw away. 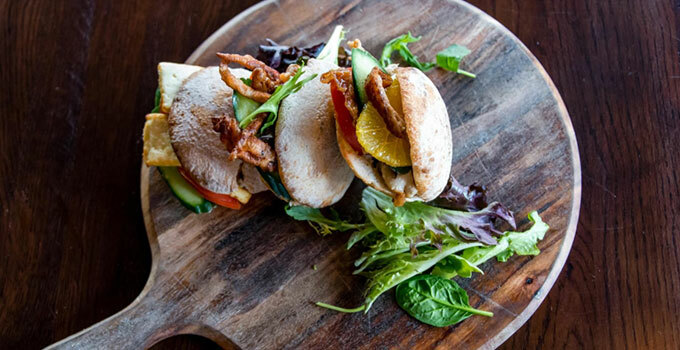 Get stuck into starters like whole baked brie medallion and charred flat bread and meat your match with mains from Cribb Street Social with smoked spiced beef brisket, Moroccan sous vide lamb, and ale and liquorice pork belly. Hydration is key before a big game – so order a cocktail jug or craft beer. And after it’s all said and done? There’s always Lefty’s Old Time Music Hall to kick on to after the whistle blows. Words by Sophia Lunn, the gourmand who’ll be visitng every place on this list before the game.